Things were looking up for the Winnipeg Goldeyes Wednesday night until the last two innings, where the team’s efforts were shut down by the visiting Gary SouthShore RailCats. A two-run lead was crushed when the Fish gave up five runs in the eighth and ninth innings falling to a 7-5 loss in the final game of a three-game series with the RailCats. For the most part, the Goldeyes kept up momentum the entire evening in front of the 5,189 fans who came out for weeknight Northern League action. 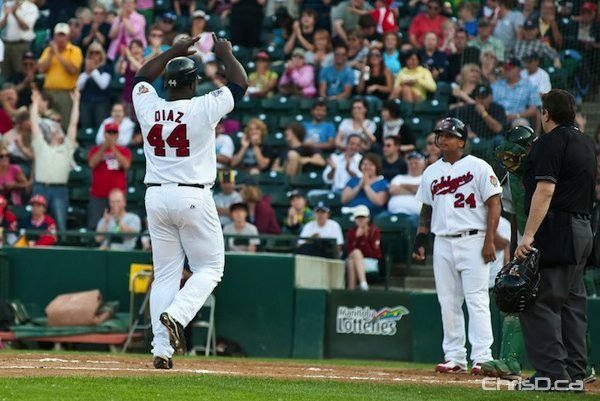 Goldeyes designated hitter Juan Diaz smacked a two-run home run — his team-leading 10th of the season — to put Winnipeg up 2-1. Right fielder Kevin West followed that with a solo home run of his own to increase the lead to 3-1. It’s the first time this season the Goldeyes have hit back-to-back home runs. Gary tied the game on a two-run single, and then added three runs in the ninth inning, courtesy of Louis Ott. Winnipeg dropped two of three games against Gary this week — the first time this season Winnipeg has lost a series at home. The Goldeyes host the Rockford RiverHawks for a four-game series beginning tonight. Game time is 7 p.m.